Please join Indy Rainbow Chamber for lunch at Blind Owl Brewery on Wednesday, May 15th. $15 Tickets are REQUIRED (Ticket includes your choice of entree and lemonade, soft drink or iced tea) and the last day for purchase is Friday, May 10, 2019. All Indy Rainbow Chamber members are invited to display marketing materials for their organization, so come ready to network and meet new faces! Keystone speaker Senator J.D. 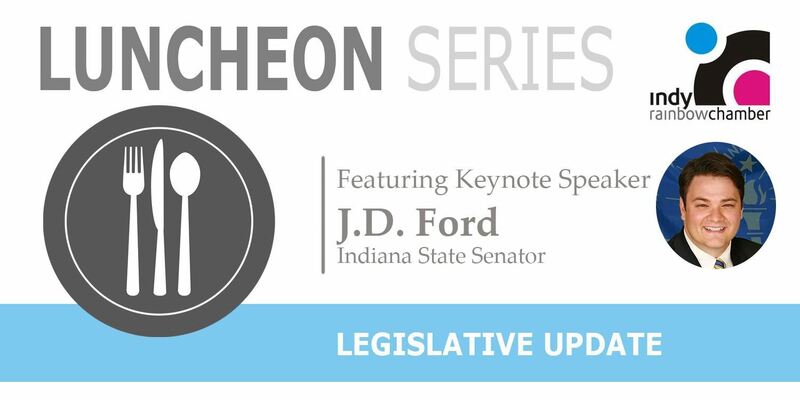 Ford will be speaking a bit about his campaign experience and giving a sneak peak about what it’s like to be in the General Assembly, as well as a legislative recap of the session. Elected on his 36th birthday, Senator J.D. Ford represents Hoosiers of Senate District 29 which encompasses parts of Boone, Hamilton and Marion counties. Senator Ford’s interests turned to public service at an early age, largely due to the careers of his grandparents. His maternal grandfather was a city councilman and his paternal grandmother was a city auditor. Senator Ford was the first person in his family to go to college. He earned a Bachelor of Science in Political Science and Criminal Justice from The University of Akron and earned a Master of Science in Education with an emphasis on Human Services from Purdue University. Senator Ford has spent much of his career in higher education, “paying it forward” from his own experience as a first-generation college graduate. He also has held numerous executive-level positions for non-profits located here in Central Indiana. Senator Ford is the first member of the LGBTQ+ community ever elected to the Indiana General Assembly and is proud to represent millennials across the State of Indiana. In his free time, Senator Ford enjoys swimming, basketball, reading, traveling and spending time with friends and family. He is also a proud member of Theta Chi Fraternity and resides in Wayne Township with his dog, Stella.